Dr Peter Hovard is currently working as a Behavioural Insights Consultant, and was previously part of the National Diet and Nutrition Survey (NDNS) team based at NatCen. As part of the ESRC’s Festival of Social Science 2016, the NDNS team ran an interactive session with a group of teenagers studying AS-level sociology. Here Peter explains how the students got involved and what made the day successful. Children are not meeting many health targets, with teenagers being the main offenders with unhealthy eating. In fact, using figures from the National Diet and Nutrition Survey (NDNS), Cancer Research UK calculated that UK teenagers drink enough fizzy drinks to fill a bathtub each year. 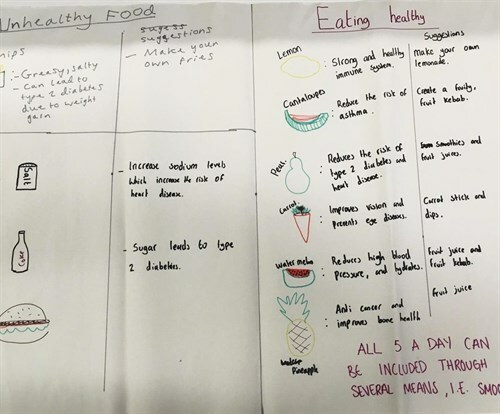 During the session last November – with students at Lillian Baylis Technology School in south London – we discussed what NDNS is and its findings in relation to teenagers’ diets. We also asked the students to think critically about the challenges associated with running NDNS in terms of gathering participant information (both dietary and bio-medical) and the impact that our findings have on health campaigns and nutrition policy, such as the NHS’s ‘Change 4 Life’ campaign. Our first group designed a social media campaign to promote healthy habit formation. 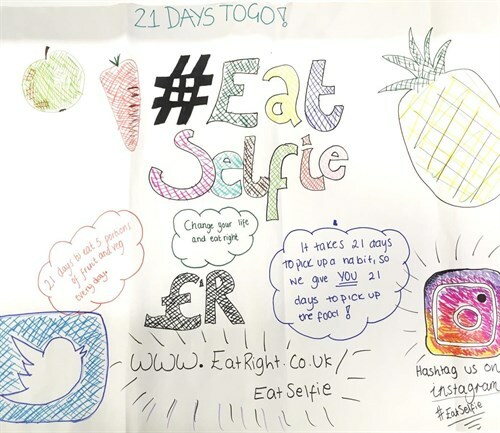 With the catchy hashtag #eatselfie this campaign was designed to get teenagers to eat their 5-a-day for 21 days, sharing a selfie on Instagram and Twitter each day that they managed it. Because it takes approximately 21 days to learn a habit, the hope is that by day 21 healthy eating will be a regular part of any teenager’s day. 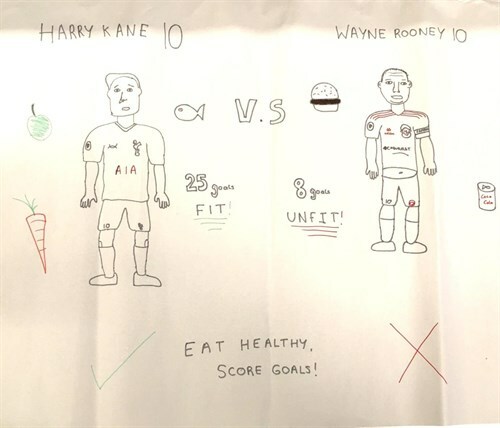 Eat Healthy, Score Goals is a poster that puts Tottenham Hotspur hero, Harry Kane, up against a less than flatteringly-drawn Wayne Rooney. The poster puts Kane’s 25 goals last season down to his healthy-eating habits, whilst an unfit Rooney only managed 8 (thanks to his burger and Coke consumption). The tag-line ‘Eat Healthy, Score Goals’ is a great way to appeal to aspiring footballers; at least in London anyway – not sure how this Rooney-bashing would be taken around Old Trafford. And, if you’re reading this, sorry Wayne. 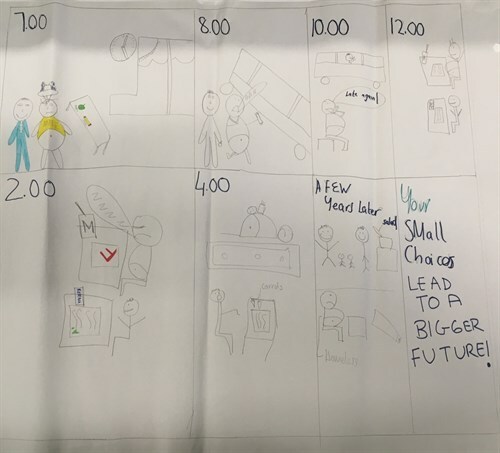 Small Changes, Big Future is a story board for a video clip that tracks the lives of two people throughout a day, and then further into the future. One of the characters benefits from healthy eating by being better able to concentrate and revise at school, eventually getting married at the end of the video. Meanwhile a less healthy character struggles through the day; missing the bus, having trouble revising for an exam, feeling lethargic and ultimately ending less happy and successful. The storyboard points out the healthy food our first character is eating along the way. Small Changes, Big Future highlights the ways eating healthily can benefit teenagers in ways that affect them both in the present and future. Say No 2 Sugar features a fizzy drinks can running away from a heart-broken teenager. The campaign also features facts about excess sugar intake that make the risks of diet-related diseases like diabetes clear to readers. 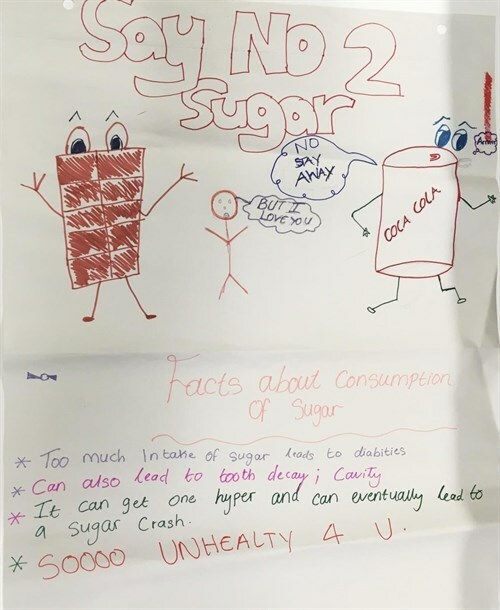 Through its doomed romance, Say No 2 Sugar has a clear message to teenagers to battle the sugar cravings for a healthier lifestyle. Last, but by no means least, our final group designed a clear unhealthy to healthy food substitution poster. The poster highlights unhealthy foods that NDNS shows teenagers are over consuming, and makes clear suggestions for healthy alternatives. Substitution suggestions like this make it easy for consumers to choose healthy options with small changes to their routines, and are currently used in the NHS’s Change 4 Life campaign. All in all it was a very successful event, with the teenagers learning a lot about NDNS and also how the sociological ideas they study can be applied in the real world. The biggest success of the day however was getting the students to engage critically with social policy and giving us some ideas of how to get across the importance of a healthy diet to teenagers. By tailoring health campaigns to specific groups this may be more effective in helping them develop a healthier lifestyle. Maybe #EatSelfie will catch on? This blog is based on Discovering diet and exploring eating with UK teenagers, which first appeared on the NatCen blog. Images are used with permission from the same source.